Ans was a German who practised in Zaragoza, Spain, in the second half of the fifteenth century. In 1477 he completed the splendid retable of the Cathedral de la Seo, at Zaragoza. b. about 1444; d. March 11, 1514. The surname Bramante comes from bramare, to desire ardently, doubtless derived from some family peculiarity. Donato, the son of Angelo, was born at Asdrualdo, near Urbino, Italy. There is no proof that he assisted Luciano da Laurana on the palace of Urbino, but the influence of that work upon his style was very great. He began as a painter, and according to Fra Castiglione had for teachers Piero della Francesca and Mantegna. In 1477 he decorated the palace of the Podestà at Bergamo, Italy, and there are still fragmentary frescos in Lombardy which are ascribed to him. He appears to have gone to Milan about 1472 in the reign of Galeazzo Maria Sforza (b. 1468; d. 1494), and to have remained there until the fall of the Sforza dynasty under Lodovieo Sforza (il Moro, b. 1451; d. 1508). Bramante's Milanese differs so much from his Roman work that it has been ascribed to a fictitious "Bramante of Milan." He built at the church of S. Maria presso S. Satiro the transept with its curious apse in perspective low relief, and the famous sacristy. He appears in the records of the "Canonica" (the interesting cloister of S. Ambrogio) in 1492 as director of the works. He is supposed to have worked on the Ospedale Maggiore. Bramante's chief work at Milan is the dome and sacristy of S. Maria dei Grazie (1492). The lower parts of that building show his influence especially. June 27, 1490, he made an interesting report, which has been preserved, on the competition for the central tower of the cathedral. Of his buildings near Milan the most important is the façade of Abbiategrasso, dated 1477, which suggests the "Nicchione" of the Belvedere, Vatican. He probably planned the cathedral of Pavia and built the nave of the cathedral of Como. Bramante seems to have settled in Rome after the capture of Milan by Louis XII, October 6, 1499. The classic surroundings developed at once an entire sympathy with antique style and proportion. 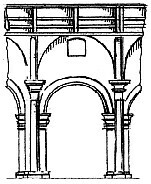 This is shown in his first building, the Tempietto of S. Pietro in Montorio, commissioned in 1502. (The upper part was added later.) The Cancellería is commonly ascribed to Bramante, but the façade bears the dates 1489 and 1495, and it was undoubtedly begun by the Cardinal Raffaello Riario as early as 1486. Vasari's words "rizoluzione di gran parte" may refer to extensive additions by Bramante. The case of the Giraud Torlonia palace, a replica of the Cancellería, is similar. In the letter of gift of this palace to Henry VII of England, dated March, 1504, it is described as "nondum perfecta". Bramante built the cloister of S. Maria della Pace in 1504. The immense palace which he built "presso San Biagio" for the offices of Julius II was famous for its magnificent use of rustication. A few fragments remain in the Via Giulia. He began the Santa Casa and the palace at Loreto. One of Bramante's most interesting works was the palace bought by Raphael in 1517 and preserved to us by a sketch of Palladio. Bramante does not appear at the Vatican until the reign of Julius II (Pope 1503-1513) who wished to unite the old Vatican with the Belvedere of Innocent VIII (Pope 1484-1492). Bramante planned an immense quadrangle, the shorter sides formed by the two palaces and the longer by galleries copied from the theatre of Marcellus. This court led by three levels up to a great apse, the Nicchione of the Belvedere. He finished the eastern gallery only. In the old Vatican Bramante built the loggie which received Raphael's decorations. The reconstruction of the Basilica of Constantine (S. Peter's) was attempted in the reign of Nicholas V (Pope 1447-1455). And again in the reign of Paul II (Pope 1464-1471). Julius II resumed the work April 18, 1506, and placed it under the direction of Bramante. At his death the four piers of the dome had been raised to the cornice and the apse opposite the main entrance had been vaulted. His design was a Greek cross, with towers in the open angles and a central dome. A complete table of the works attributed to Bramante is given in Von Geymüller. Bramante is supposed to have been inalfabeto (illiterate), but there are several sonnets and other poems and some fragments of manuscripts which are attributed to him. architect, engineer, and epigraphist of Verona, Italy; d. between 1515 and 1519. Fra Giocondo was a Franciscan monk and one of the most learned men of his time. He made a collection (begun 1477) of two thousand Latin inscriptions, which was dedicated to Lorenzo de' Medici (Corpus Inscriptionum Latinorum, Vol. III, p. xxvii.). He published a celebrated critical edition of Vitruvius, in 1511, dedicated to Pope Julius II. The charming Loggia del Consiglio at Verona (1476-1492) is attributed to him without documentary evidence. In 1489 Giocondo entered the service of Ferdinand I, king of Naples. After the capture of Naples by Charles VIII in 1495, he followed the French king to Paris, and in 1497 was established at Amboise. Jehan Jocundus, deriseur de Bastimens is mentioned twice in Archives de l'Art Français, (Vol. L, pp. 108, 116). The château of Gaillon, the Pont Notre Dame, the old Chambre des Comptes, and other works in France have been ascribed to him. In fact, however, his name is not found on the records of any important structure of the time, except the Pont Notre Dame at Paris (1499- 1512). In 1513 Giocondo was associated with Raphael and Giuliano da San Gallo in the construction of S. Peter. A design for that building, attributed to him by Antonio da San Gallo (II), is in the Uffizi. Column from the Church of Sta. Maria del Popolo, Rome, by Baccio Pintelli. One division of the nave of Sta. Maria del Popolo, built at Rome in the fifteenth century by order of Sixtus IV, from the design of Baccio Pintelli, Florentine architect.